Put-Em Arounds Diana Dinzey EDU. Overview Talking wall communicator gives nonverbal children the ability to initiate communication through the day. Users. 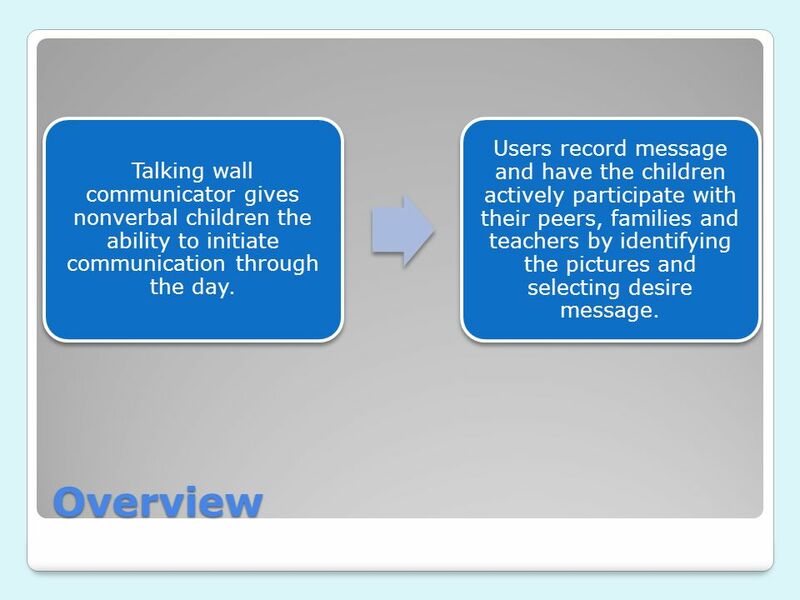 2 Overview Talking wall communicator gives nonverbal children the ability to initiate communication through the day. Users record message and have the children actively participate with their peers, families and teachers by identifying the pictures and selecting desire message. 3 Who Benefits Children needing communication support. 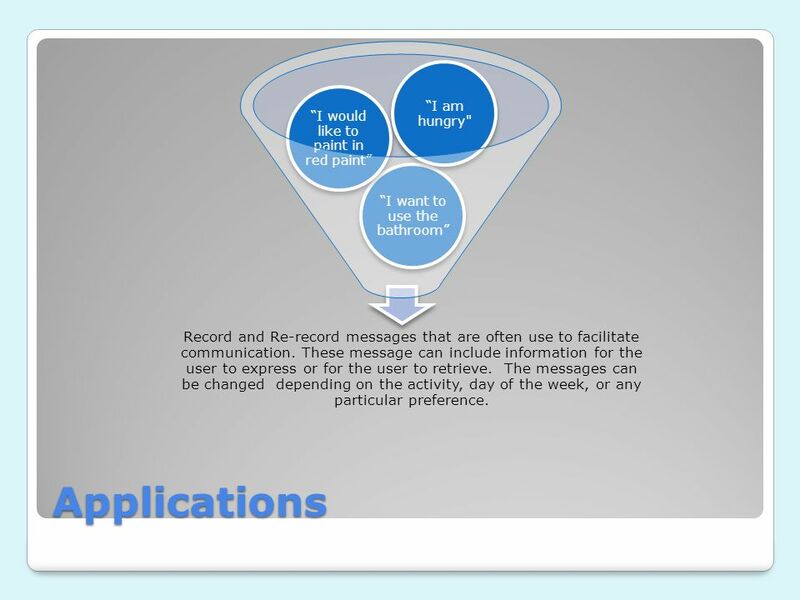 4 Applications Record and Re-record messages that are often use to facilitate communication. These message can include information for the user to express or for the user to retrieve. The messages can be changed depending on the activity, day of the week, or any particular preference. I want to use the bathroom I would like to paint in red paint I am hungry"
5 Specifications Requires 4 AA batteries. Pictures used to identify desire message. ON/OFF/Volume knob To Record: simply press and hold the RECORD button on the back panel of the unit, while simultaneously holding down the plate switch. While continuing to hold the record button and the plate switch, speak your message. To Play: Just activate the plate switch. 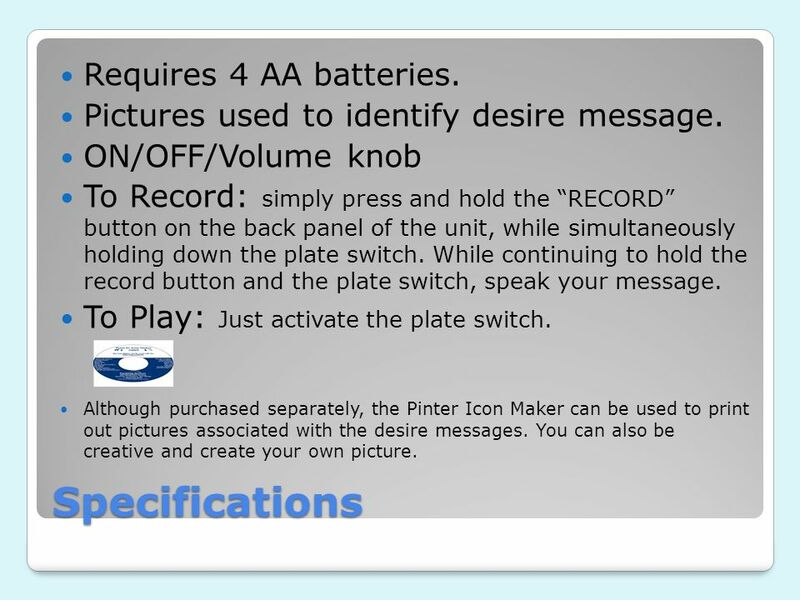 Although purchased separately, the Pinter Icon Maker can be used to print out pictures associated with the desire messages. You can also be creative and create your own picture. 8 Recommendation I would recommend this product because it enables independency and initial communicative participation. 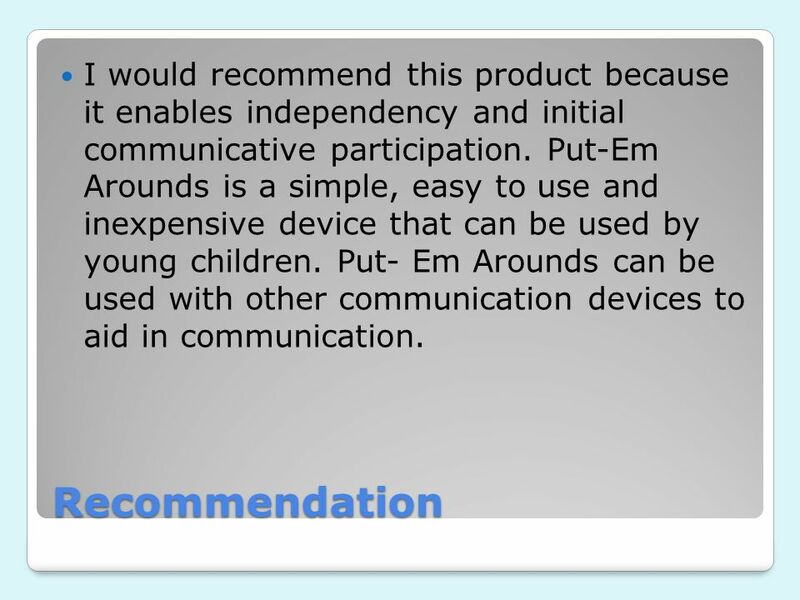 Put-Em Arounds is a simple, easy to use and inexpensive device that can be used by young children. 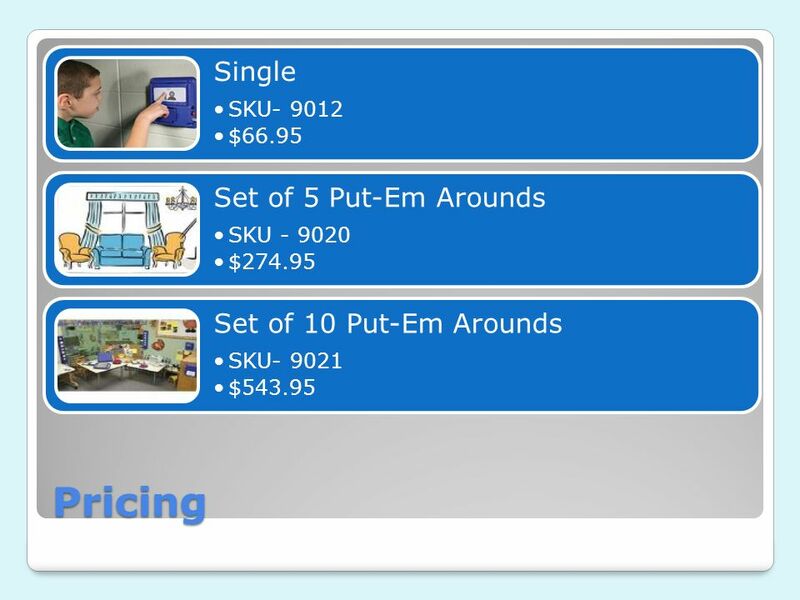 Put- Em Arounds can be used with other communication devices to aid in communication. 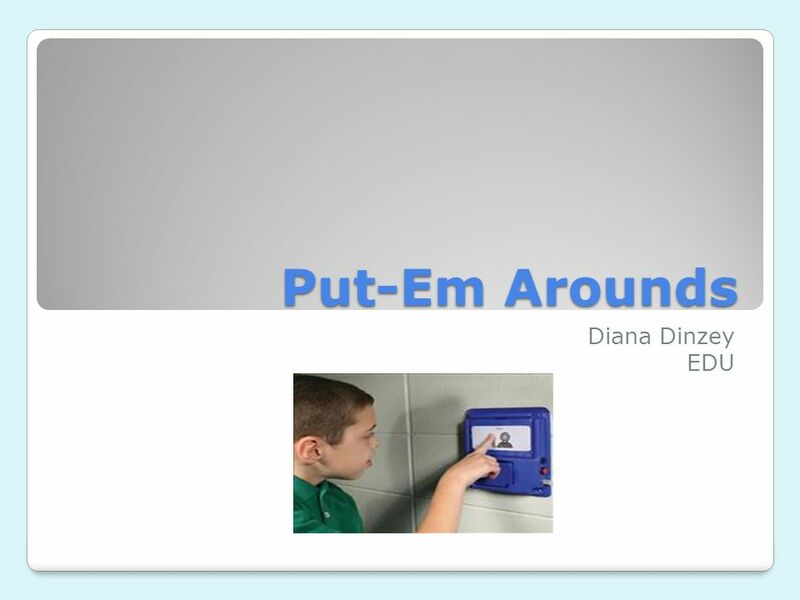 Download ppt "Put-Em Arounds Diana Dinzey EDU. 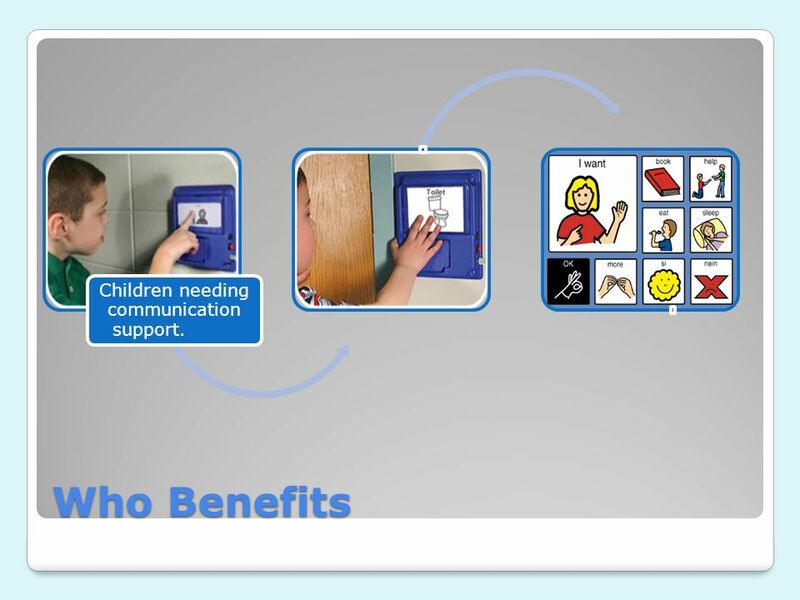 Overview Talking wall communicator gives nonverbal children the ability to initiate communication through the day. Users." Click to continue click to go the web site click to End Show Three minutes that could save your life er123.com Universal, Multilingual Electronic Records. Modified Virtual Tour. 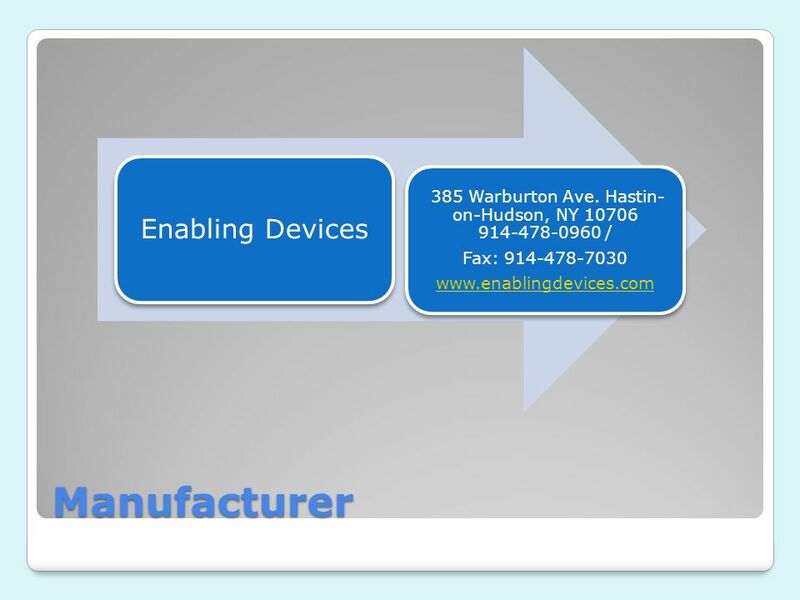 Supply Management Online Main Menu The Main Menu provides a suite of offerings designed to meet the needs of our customers. The Basic Sharing Screen Here is the basic Adobe Connect display screen. The Pod arrangement may differ but your controls will be the same. Pods are the. Product Presentation. WHAT IS IT? Product Presentation. AutoBid Welcome to the AutoBid Tutorial. AutoBid Autobid is ideal for those who like to benefit from the auction savings but do not have the time to participate. 1 Communication Methods Audio, video and chat. 2 Objectives Identify different methods of communication – non- verbal, audio, video, and chat Identify. AV Controls in the Conference Rooms Trying to Navigate the Changes. PRINTERS & PRINTING The Basics. FIRST THOUGHTS Because of the different makes & models available, we will need to talk in generalities to a large degree. I TEC TRAINING This training session will explain how to use ITEC equipment and support learning in the classroom setting. Presented by: R. Schmid. Controls & Widgets. Overview General controls & widgets Switch Button Dial Latch Slider Handle Physical only Jog dial Joystick Track ball Digital only. MultiChat 15 Vocabulary File for the ChatPC Silk and ALT-Chat. Assistive Technology for students with disabilities AMDi Tech/Talk Communication Device. By Tara Ciesiolka and Nikki Stevens.  Technology can be used to download music for sites such as I-Tunes inexpensively.  There are many websites that.